Los Angeles, CA, USA: Vasyl Lomachenko (13-1) W KO 4 Anthony Crolla (34-7-3). Light Heavy: Gilberto Ramirez (40-0) W RTD 4 Tommy Karpency (29-7-1). Welter: Arnold Barboza (21-0) W TKO 3 Mike Alvarado (40-5). Welter: Alex Besputin (13-0) W PTS 10 Alfredo Blanco (20-8). Middle: Janibek Alimkhanuly (6-0) W PTS 10 Cristian Olivas (16-5).Heavy: Guido Vianello (3-0) W TKO 1 Lawrence Gabriel (3-2-1). Lomachenko spent the round tracking Crolla around the ring. There were very few punch thrown or landed as Crolla was not looking to engage so was not committing himself. Lomachenko landed a straight left and a right to the body to take the round. Crolla started the round in ring centre and trying some punches. He connected with a good right to the body but was soon in full retreat with Lomachenko stalking him around the ring. Lomachenko scored with hooks and uppercuts late in the round. Crolla was hesitant and not committing himself to his punches. Lomachenko continued to walk down Crolla. Just before the bell he trapped the challenger on the ropes and bombarded him with rights and lefts. Crolla slumped down to be sitting on the ropes. The referee stepped in to give Crolla a count. Lomachenko though the fight was being stopped and started to celebrate but two officials climbed into the ring to stop his celebrations and lead him to a neutral corner. The referee unaware of this continued with the eight count and then turned and saw the two officials in the ring. He ushered them out and then motioned for the fight to continue but the bell went. Lomachenko finished the fight in style. He haunted Crolla along the ropes then landed a left to the body and a short right hook to the temple which sent Crolla face down to the canvas. The referee did not need to count and Crolla who had a long cut under his left eye and a nose bleed took some time to recover. Lomachenko was making the first defence since he unified the WBA and WBO titles by beating Jose Pedraza in December. He has said he would be willing to drop back down to super feather and would fight Gervonta Davis for free but has also named Mikey Garcia as a possible opponent. Those decisions will have to wait as it seems that Lomachenko damaged a knuckle on the middle finger of his right hand. It is not said to be a serious injury but he may be unable to spar for a few weeks. Crolla, 32, had been No 1 with the WBA after wins over Ricky Burns, Edson Ramirez and Daud Yordan but will now have to think about where he goes from here. Whilst still holding onto his WBO super middle title Ramirez tests the water at light heavy with victory over an out-gunned Karpency. In a competitive first round these two southpaw were letting their punches fly early. Karpency was looking to take the fight to Ramirez and landed some good left but Ramirez was snapping to the body with left hooks and connected with a strong left to the head. Ramirez controlled the second. He was reaching Karpency with long jabs and then throwing sweeping left hooks. Karpency tried to get in close but Ramirez unleashed combinations which pierced Karpency guard and although he tried to bang back Karpency was already showing blood from his nose and mouth and had a bump under his left eye and was fading out of the fight. Ramirez continued to break Karpency down in the third. Karpency was moving into survival mode but with Ramirez losing some of his accuracy Karpency managed to see out the round without too much punishment. Ramirez was unloading with long and short punches in the fourth. Karpency tried to rally and fire back but his face was smeared with blood from his nose and a vertical cut over his left eye and his corner pulled him out of the fight at the bell. Workmanlike job by Ramirez as he was a class or two above Karpency. Talk now is of Ramirez staying at super middle for a unification fight with Callum Smith. They have combined records of 65-0 and Smith is marginally taller (Ramirez 6’2 ½” to 6’3” for Smith) and have similar statistics for inside the distance wins (Ramirez 26 from 40 fights and Smith 18 from 25 fights) so an intriguing match-up if the managements and sanctioning bodies let it happen. Karpency, 33, was a good choice as a test at light heavy for Ramirez, He has lost in world title challenges to Nathan Cleverly and Adonis Stevenson and was stopped in 2016 by Oleg Gvozdyk and had only two low level wins in the last 17 months so vulnerable. Barboza finishes Alvarado inside three rounds. Barboza showed impressive hand speed and good movement with Alvarado trying to get inside to work but being too slow to cut off the ring. Barboza was shooting rapid-fire bursts of punches with Alvarado occasionally getting through with hooks to the body. Alvarado pressed hard throughout the second and had some success inside but Barboza was making him pay pulling him up with crisp uppercuts as he came forward and connecting with jabs, hooks and uppercuts. Alvarado was advancing in the third when he was nailed by a perfect right uppercut followed by a left to the head. Alvarado dipped at the knees and retreated. Barboza walked forward throwing straight lefts and rights until a right to the head sent Alvarado down on his back. He tried to climb to his feet using the ropes but fell to the canvas again and when he did get up his legs were rubber and the referee stepped in to save him. The 27-year-old Barboza could be in line to challenge fellow Top Rank boxer Juan Carlos Ramirez for the WBC super light title later in the year. He is not currently rated by the WBC but showed real talent here. Former WBO champion Alvarado was 33-0 at one time but then had a 1-4 spell including losses to Ruslan Provodnikov, and Juan Manuel Marquez and going 1-2 in fights with Brandon Rios. He had won his last six fights against modest opposition but this was a crushing loss and perhaps it is time to hand the gloves on a nail. Russian Besputin wins a comfortable points victory as he keeps busy whilst awaiting a world title shot. Argentinian Blanco caused Besputin some problems early with his clumsy awkward style and constant switching of guards and it did not help that a clash of head in the second saw Besputin cut over his right eye. Once Besputin settled Blanco faded out of the fight. It was not a sensational display by Besputin but he used his superior skills to control the fight. He never really had Blanco in serious trouble but then Blanco has never lost inside the distance and despite tiring the South American made it to the final bell here. Scores 100-90 twice and 99-91 for the 27-year-old Besputin. He is a former Russian and European gold medallist and is No 1 with the WBA so a potential opponent down the line for fellow-Top Rank boxer Terrence Crawford. Argentinian No 5 Blanco had gone the distance in Australia against Cameron Hammond and Jeff Horn and had won his last four fights, three in the first round. Former top amateur Alimkhanuly breezes past useful Mexican Olivas as he moves up to ten rounds for the first time. Alimkhanuly took a couple of rounds to get rolling but then dominated the fight. He showed a good variety of punches and angles and denied Olivas the chance to work inside with a sharp and accurate right jab. Alimkhanuly does not have a reputation as a puncher and although he handed out plenty of punishment apart from the sixth when he rocked Olivas with a right he never really had Olivas in trouble although the Mexican was cut over his right eye from a clash of heads in the ninth. Scores 100-90 twice and 99-91 for Alimkhanuly who wins the vacant WBC Americas title (and yet another invented sanctioning fee seeker) the WBO Global title. The 26-year-old from Kazakhstan won gold medals at the Asian Championships and Asian Games, was a gold medallist at the 2013 World Championships beating Anthony Fowler in the semi-finals and Jason Quigley in the final and reached the quarter-finals of the 2016 Olympics. I guess the WBO Global title will get him a rating! Three losses in a row for Olivas who had lost against unbeaten fighter Bilal Akkawy and Tyler Howard in his previous two fights. Italian heavyweight hope Vianello makes it three out of three inside the distance as he stops Gabriel in 49 seconds. The Italian was stalking a retreating Gabriel and as Gabriel pawed with a weak left Vianello sent a right cross over the top and on to the side of Gabriel’s head. Gabriel backed to the ropes badly shaken and as Vianello followed up Gabriel dropped to the floor. He made it to his feet but was in no condition to continue. The 6’6” 24-year-old Vianello is a former Italian champion who represented Italy at the World Youth Tournament, losing to Hughie Fury, getting a silver medal at the European Union Championships and competed at the European Games and the 2016 Olympics as well as fighting for the Italia Thunder Team in the World Series of Boxing. Apart from the defeat by Fury he also lost three times to Frazer Clarke so UK fighters can’t be his favourite opponents. He has shown real destructive power so is one to follow. Second loss by KO/TKO for Gabriel. Monterrey, Mexico: Super Welter: Jaime Munguia (33-0) W PTS 12 Dennis Hogan (28-2-1). Super Welter: Patrick Teixeira (30-1) W PTS 10 Mario Lozano (33-9). Feather: Diego De La Hoya (21-0,1ND) ND 2 Enrique Bernache (24-12,1ND). Feather: Irving Turrubiartes (20-0) W PTS 8 Jason Canoy (27-10-2). Minimumweight: Daniel Valladares (20-1) W TKO 7 Merlito Sabillo (27-7-1). Munguia retains the WBO title on a majority decision but Hogan has strong grounds for an immediate return. Another close round. Munguia was trying to cut the ring off but Hogan was constantly moving and changing direction then darting in with jabs and this time he just took the round. Hogan landed a right to the head as things livened up. Munguia was doing a better job of chasing Hogan down and connected with rights and used a strong jab to pocket the points. Hogan was conceding height and reach but making up for that by movement and speed. A frustrated Munguia was over committing himself and Hogan was making him pay with quick, accurate hooks in this round. A much better round by Munguia. He was getting much closer to Hogan and letting his hands go more. He was connecting with left hooks to the body and dangerous rights. Hogan was not moving as quickly as he had been and not changing direction as much making it easier for Munguia to cut off the ring. Munguia’s round again. He was getting home throughout the round with his left hooks to the body and hunting Hogan around the ring. Hogan was still boxing cleverly but not throwing enough or landing enough and some of his work was ragged. This was a closer round but still Munguia’s. The Mexican was walking down Hogan and raking him with left hooks and got through with a crisp right uppercut. Hogan was coming up short when he dipped inside and although he did catch Munguia with a strong right counter he had slowed. Hogan got back into the fight in this one. He threw more punches and with more accuracy. Munguia was still landing some scorching left hooks but was wild with his right and Hogan was firing off useful hooks. Hogan was back in this fight. Instead of counter punching he was walking inside and scoring with hooks. Munguia was loading up on his punches and swinging wildly whereas Hogan was scoring with clusters of light shots. The fight had changed. Now it was Hogan taking the fight to Munguia and putting Munguia on the back foot. Hogan was coming forward firing short punches and catching Munguia with hooks to send the champion stumbling back. Munguia doesn’t like to box on the back foot but that was what he was being forced to do. Hogan rocked Munguia back on his heels with the first punch he threw in this round. From there Munguia pressed hard pumping out punches but he was finding Hogan a difficult target and Hogan was picking Munguia off with quick, short punches and rocked Munguia back with another right and just had the edge. Munguia needed a big last round and he delivered it. He was scoring with hooks on a tired Hogan and looked to have Hogan rocky twice. Hogan banged back but was by far the more tired and it was clearly Munguia’s round. Official Scores: Young 115-113 Munguia, Roldan 116-112 Munguia, Levine 114-0114. Tall Brazilian southpaw Teixeira starts brightly but then fades and finally struggles to get win majority decision win over Lozano. Teixeira captured the early rounds. He had quicker hands and better movement than the sluggish Lozano. As the fight progressed Teixeira’s attacks became more predictable and Lozano was rolling over the second half of the fight taking the action to Teixeira. Lozano looked to have clawed back the Brazilian’s early lead but it was just not enough to get him the decision. Scores 96-94 twice for Teixeira and 95-95. Teixeira, 28, looked hot when putting together a run of 26 wins but the opposition had not been strong and a brutal second round loss to Curtis Stevens in 2016 saw him inactive for 14 months. Despite a win over Nathaniel Gallimore in September he seems to have lost something. Mexican Lozano, 31, looked to be on the slide with a run of four losses but the opposition had mainly been world class and he had rebuilt with four wins going into this one. Disappointing end as a clash of heads causes this contest to be stopped and declared a No Decision. Del La Hoya had the edge in the first round as heads banged together in the second Bernache suffered a large vertical gash in the centre of his forehead and was unable to continue. De La Hoya is rated WBA 3/ WBO 5/ WBC 7 so this fight would have provided some useful ring time in preparation for a title chance at the end of this year or early next. Bernache had lost 3 of his last 4 but usually goes the distance. A good night for Monterrey fighters as Valladares stops former WBO minimumweight champion Sabillo. The Filipino constituted a big step up in quality of opposition for Valladares so an important win his twelfth by KO/TKO. Sabillo, 35, was 23-0-1 at the start of his career but is on the down slope now being 2-5 in his last 7 fights. Los Mochis, Mexico: Super Light: Marcos Villasana Jr (24-6) W PTS 12 Roiman Villa (19-1). Fly: Brian Mosinos (16-2) W PTS 10 Mario Rodriguez (23-17-5). Villasana gets controversial split decision over Venezuelan Villa. With the visitor having won all of his 19 contests inside the distance it was unexpected that Villasana decided to stand and trade instead of boxing. That led to a whole series of exciting exchanges with neither boxer wanting to take a step back. Those tactics saw Villasana badly cut but he survived three doctor’s inspection to keep fighting. There was never much between these two but Villa looked to have the edge after ten rounds although Villasana finished the stronger. Scores 115-112 twice for Villasana and 114-113 for Villa/ The 27-year-old from Acapulco wins the vacant WBC Fecarbox title and now has eight wins in a row including victories over Nery Saguilan, Jose Felix Jr and Pablo Vicente but he has rode his luck in a couple of those. Not much in the way of quality in the opposition Villa has met with ten of his opponents never winning a fight but he has beaten a couple of reasonable level opponents. Best career win so far for Mosinos as he outclasses former IBF minimumweight champion Rodriguez to win the vacant WBC Fecarbox belt. Scores 99-91 twice and 100-90. The 23-year-old from Mexico City was taking a huge step up as the two opponents he lost to in 2017 and 2018 had combined records of 6-3-1. “Little Dragon” Rodriguez at 5’1” continually has to give away height and reach and has struggled since losing his IBF title back in 2013 being 8-11-1 in his last 20 fights. Hampton, NH, USA: Welter: Derek Silveira (16-2) W PTS 8 Roberto Valenzuela Jr (14-1). Cruiser: Vincenzo Carita (20-1-1) W KO 1 Claudio Porto (8-5-1). Super Bantam: Tramaine Williams (17-0,1ND) W PTS 8 Ernesto Guerrero (31-27). Silveira wins the vacant New England title with wide unanimous decision over Mexican Valenzuela. Silveira put Valenzuela down in the first but was on the floor himself in the last before running out the winner. Scores 79-71, 79-73 and 78-72 for Silveira. “The Surgeon” has won 8 of his last 9 losing only to Greg Vendetti for New England bragging rights in January last year. Valenzuela had scored eight first round wins but Silveira was too good here. Silveira has the distinction of having beaten both Valenzuela Jr and his father Roberto. That is not entirely unique as Jersey Joe Walcott beat both Phil Johnson and his son future world champion Harold. In a disgraceful mismatch “The American Nightmare” Carita gets this one over quickly as a body punch late in the opening round drops Porto who did not beat the count. The 34-year-old from Boston wins something called the American Boxing Federation Continental Americas title with his nineteenth win by KO/TKO. He is 16-0-1 in his last 17 fights but don’t look too closely at his opposition. Brazilian Porto, 47, suffers his fifth first round loss in a row in only his second fight in 26 months. Home town fighter Williams gets his second win of the year with a points decision over Guerrero. Williams comfortably outboxed Guerrero but the Mexican was competitive and stayed around to allow Williams to get some ring time under his belt. Scores 80-72 twice and 78-72. Williams had finished a fight in February in just 79 seconds and since that was his first fight for eleven months he needed this ring time. A former National Golden Gloves champion Williams turned pro in 2012 after failing to get through the US Olympic Trials for a spot on the London team. Guerrero experienced but very limited. Catamarca, Argentina: Super Welter: Cesar Barrionuevo (35-4-2,1ND) W KO 1 Juan Lencina (22-3-3). In a non-title fight Argentinian champion Barrionuevo knocks out fellow-southpaw Lencina inside a round. A left to the head rocked Lencina early and as Barrionuevo came forward a clash of heads opened a bad cut over Lencina’s right eye. He tried to take the fight to Barrionuevo but with his backs to the ropes Barrionuevo connected with a right to the head. Lencina took a step back and then dropped to the canvas and was counted out. Barrionuevo, 30, is rebuilding after losing a big fight to Yordenis Ugas in September, only his second loss in his last 31 fights. This is win No 25 by KO/TKO. Former argentine champion Lencina, 35, has now lost three times by KO/TKO. Former undefeated Commonwealth champion Zerafa eases back with a second round kayo of fading veteran Sherrington. First fight for the Melbourne 27-year-old since losing to Kell Brook in December and fifteenth win by KO/TKO. Sherrington, 36, a former WB Foundation middleweight and Australian super middle champion, has now suffered four losses in a row by KO/TKO. Douai, France: Welter: Steve Jamoye (25-7-2) W PTS 10 Mehdi Mouhib (17-1). Super Welter: Fouad El Massoudi (17-11) W PTS 10 Barthelemy Lefebvre (17-101-1). Welter: Daouda Sow (20 -2) W PTS 6 Aleko Lursmanashvili (4-8). Jamoye is rarely in a bad fight but does not always get justice when he travels. This was another war on the opposition’s home patch but this time the Belgian took the decision. They exchanged punches constantly with Jamoye ploughing forward and Mouhib trying to stop his charges with good counters. A fiery third saw them both connecting heavily and Mouhib occasionally managed to keep Jamoye out, but not for long. Jamoye scored with scything hooks in the ninth but lost a point in the tenth for spitting out his mouthguard but by then had already done enough to ensure he came out the victor. Scores 96-93, 97-92 and 95-94 for Jamoye. He wins Mouhib’s WBFederation Inter-Continental title and lifts the vacant IBO Mediterranean belt. Former Belgian champion Jamoye was 1-3-1 in his last five fights before this win but he is always capable of springing a surprise. Mouhib was coming off a couple of inside the distance victories but Jamoye’s pressure was too much for him. El Massoudi makes it a bad night for the locals as he outpoints Douai’s Lefebvre to win the vacant French title. In the first round Lefebvre started out trying to use his jab to control the aggressive El Massoudi. It worked in that round but from the second Lefebvre was forced to stand and trade which handed the fight to El Massoudi who simply outworked the more skilful local and even outlanded him when Lefebvre managed to find some space. They went toe-to-toe in the last as Lefebvre put in a big effort but El Massoudi was a clear winner. Scores 98-92 twice and 98-93. El Massoudi wins the French title at the third attempt. After a 1-6 run he has now won his last three fights. Lefebvre was having his second shot at the title. Southpaw Sow gets a win for the local fighters as he easily outpoints Georgian Lursmanashvili. Sow was in a different class as far as skill is concerned but Lursmanashvili forced the former amateur star to fight hard in every round and they even continued to exchange punches after the final bell. All three cards had Sow winning 60-54. Now 36, Sow won a silver medal at the 2008 Olympics beating Jose Pedraza and Yordenis Ugas but losing to Russian Alek Tischenko. After winning his first 18 contests losses to Renald Garrido and unbeaten Yazid Amghar derailed him and this is his first fight for two years. Lursmanashvili is 1-7 in his last 8 fights. Follonica, Italy: Super Feather: Giuseppe Carafa (11-3-1) W TKO 4 Francesco Invernizio (9-8-1). Carafa wins the vacant Italian title with stoppage of Invernizio. The 24-year-old Carafa gets only his third win by KO/TKO and Invernizio his second loss by KO/TKO. Carafa had lost to unbeaten Michael Magnesi for this title in his last fight in November. Invernizio is 0-3 in his last three fights consisting of one challenge for the Italian lightweight title and two at this vacant title. Singapore: Super Feather: Hamzah Farouk (8-0) W PTS 10 Paiboon Lorkham (19-12). Feather: Mark Magsayo (19-0) W KO 4 Erik Deztroyer (12-5-1). Not much of a fight here as local boxer Farouk towered over the small , balding Thai. Lorkham’s tactics varied between just laying back on the ropes and trying to bob and weave and then march forward head down throwing wild swings. Farouk found the little Thai elusive at times and got caught with those wild swipes but on other occasions was able to catch Lorkham cleanly when the Thai just dropped his hands and was too slow to dodge some of the punches. Scores 99-91 twice and 97-93 for Farouk. There were plenty of flaws in Farouk’s work and he looks unlikely to go far. At 40 and just 5’3 ½” Lorkham should not be fighting let alone fighting at super feather. Magsayo returns to action after a long break and is classes ahead of Indonesian Deztroyer. From the opening bell Magsayo was landing wicked left hooks to the body and straight rights to the head with poor Deztroyer just soaking up the punches. This was Magsayo’s first fight since November 2017 and although he was again scoring with left hooks in the second and third he was not sustaining his attacks looking to get in some ring time. Magsayo ended it in the fourth. He landed a rib crunching left hook to the body that had Deztroyer retreating to a corner and then slumping to the floor propped up against the ring post and he just sat out the full count. Now 14 wins by KO/TKO for the Filipino “Magnifico”. Magsayo, 23, was the WBO No 2 before his inactivity so will be looking to climb the ratings with a couple more fights. Deztroyer-real name Ery Subiyasno-was having his first fight of record since March 2018. Minneapolis, MN, USA: Middle: Sergiy Derevyanchenko (13-1) W PTS 12 Jack Culcay (25-3). Super Middle: Peter Quillin (34-1-1,1ND) ND 2 Caleb Truax (30-4-2,1ND). Light: Chris Colbert (11-0) W TKO 2 Mario Briones (29-9-2). Derevyanchenko gets close unanimous verdict over Culcay in an IBF eliminator and puts himself in line for a shot at the winner of Saul Alvarez and Daniel Jacobs. The opening round saw both fighters cautiously probing with their jab and trying quick attacks. Both fighters are good tacticians with Derevyanchenko just doing enough to take the points. Culcay evened things up using quicker hands and excellent footwork to outbox Derevyanchenko in the second and third with Derevyanchenko not letting his hands go enough and finding the quick Culcay a difficult target. Derevyanchenko had a much better fourth as he applied three minutes of pressure connecting with strong jabs and a couple of heavy right crosses. At this point I had them level at 38-38. Derevyanchenko was really rolling in the fifth. He was hunting Culcay down scoring with powerful jabs and connecting with hooks to the body. Late in the round Culcay landed the best punch so far in the shape of a peach of a right uppercut that shook Derevyanchenko but it was easily Derevyanchenko’s round. Derevyanchenko was relentless in the sixth coming in under Culcay’s jab and firing hooks to head and body with Culcay too busy defending to get on the front foot. Culcay was tired of getting bullied and he stood and interchanged punches at the start of the seventh. Aggression from Derevyanchenko eventually put Culcay on the back foot and Derevyanchenko finished the round with a strong attack. The eighth was a good round for Derevyanchenko. After an early attack from Culcay when he landed two cracking rights the Ukrainian took over driving Culcay around the ring scoring with overhand rights and hooking to the body with both hands. For me Derevyanchenko had swept the last for rounds and I had him 78-74 up. This really was a high quality fight. Culcay knew he had to turn things around and he tried hard in the ninth standing and trading where his quicker hand speed inside gave him the edge. Derevyanchenko’s power then put him in charge as he landed thumping rights to the head and worked to the body. Derevyanchenko looked to be taking the tenth but then Culcay landed a right to the head that sent Derevyanchenko back tumbling into the ropes Culcay launched a furious attacks and connected with more head punches that had Derevyanchenko floundering and in deep trouble just as the bell went. A big round for Culcay but it had come too late. A clash of heads saw Culcay cut outside his left eye and Derevyanchenko in his hairline. Two tired boxer slugged it out in the eleventh. Culcay just seemed to have that bit more in the tank and although they both scored well Culcay just had the edge. In the last it was Derevyanchenko with the power and energy. He simply punched Culcay to a standstill connecting with hooks and uppercuts with Culcay trying to punch with him but taking shot after shot. A great middleweight scrap and I had Derevyanchenko winning 116-112. Official scores 116-112 twice and 115-113. Huge result for Derevyanchenko as with Culcay being No 2 and himself No 3 the winner becomes the official challenger for the IBF title. Derevyanchenko lost a split decision to Daniel Jacobs in October but Alvarez would be a bigger match if he wins the fight against Jacobs on May 4th although whoever wins will probably be looking for bigger fights. Culcay played his part in a quality fight and in losing probably gave one of his best displays. Cuts were a feature of the fights this weekend and another one ended this contest early. After a fairly even first round a brutal coming together of head saw Truax with a bad cut above his right eye. At the end of the round the doctor and the referee agreed the cut was too bad for Truax to continue so the fight ended as a No Decision. Both needed some serious ring time and were looking to build on wins in their last fight so a disappointing night for all concerned. Brooklyn hope Colbert demolishes Briones in a fight between two boxers heading in different directions. Colbert was sharp in the first and it already looked like an early night. In the second he put Briones on the canvas with a southpaw left and although Briones managed to get to his feet Colbert blitzed him with punches from both hands and the referee halted the fight. Fourth win by KO/TKO for the 22-year-old Colbert who in theory was moving up to ten rounds for the first time. Briones, 33, has gone from 20-0-1to 29-9-2 so a descending path. Halle an der Saale, Germany: Light Heavy: Dominic Boesel (28-1) W TKO 8 Timy Shala (23-3-1). Heavy: Erik Pfeifer (5-0) W PTS 6 Kostiantyn Dovbyshchenko (4-3-1).Heavy: Peter Kadiru (2-0) W KO 4 Vincenzo Febbo (3-1).Light Heavy: Tom Dzemski (12-0) W PTS 6 Jozef Jurko (5-1). Boesel retains the European title with stoppage of very late substitute Shala. Boesel was to have defended against Orial Kolaj but after the weigh in Kolaj reported a rib injury and was replaced by Shala. Boesel made a good start flooring Shala in the first. As Shala rumbled forward Boesel showed him a left jab and then connected with a straight right that felled Sharma heavily but he made it to his feet and to the bell. Boesel lost his way a little over the next three rounds and Shala had a good fourth pressing the fight and forcing the champion onto the defensive. Boesel found his rhythm again in the fifth and by the end of the sixth not surprisingly Shala began to tire. In the seventh Boesel floored Shala heavily with a right and he was pounding on Shala with a series of rights in the eighth when the referee stopped the fight. Second defence of the European title for Boesel and his eleventh win by KO/TKO. He sits high in the ratings at WBO 2/WBC 3/WBA 13 and although he is No 3 with the IBF he is their highest rated fighter but can’t move to No 1 or No 2 as he has not beaten a rated fighter. He should land a shot at one of the belts later this year. Shala, 33, had lost a wide unanimous decision to Boesel in 2015 and was knocked out in eleven rounds by Erik Skoglund in 2016 but had scored two low level wins since then. Although nicknamed the “Albanian Bomber” Shala was born in Kosovo and is a former Austrian champion. Pfeifer struggles against Ukrainian in what should have been an easy win and has to settle for a majority decision. Pfeifer’s better skills particularly his jab gave him the edge in this one but Dovbyshchenko proved a tough customer and connected too often for Pfeifer to ever be comfortable and in the end it was a disappointing performance by Pfeifer. Scores 59-55, and 58-56 for Pfeifer and 57-57. Although winning plenty of competitions as an amateur and twice beating Rio gold Medallist Tony Yoka the Russian-born German is now 32 and is unlikely to make it to the top. Dovbyshchenko competed in the Ukrainian Championships and then fought as a pro and then went back to amateur and back to pro again. Kadiru gets his first inside the distance win as a pro as he flattens gutsy Italian Febbo in the fourth round. The tall German was in charge of this one all the way. He gradually stepped up the pressure with a strong jab and some meaty hooks. In the fourth a huge right to the head sent Febbo down and out cold spread-eagled on the canvas and it was a few minutes before he recovered. Early days and still some rough edges but the 21-year-old 6’4 ½” German has tremendous potential. He was a gold medallist at the Youth Olympic Games and twice at the European Under-19 Championships and at the Under-22 Championships. German-based Italian Febbo did well to last to the fourth. Dzemski continues to make steady progress. The local boxer was given some useful ring time by Slovakian Jurko who came to win. Dzemski had the better skill set and boxed confidently. He shook Jurko in the fourth but Jurko did not fold and did enough to take a round and make Dzemski work hard. Scores 59-55 twice and 58-56 for Dzemski. The 22-year-old hope is the son of former German champion Dirk Dzemski who was 27-2 as a pro and is now one of the top trainers in Germany. Jurko had won his last three fights inside the distance but was in his first six round fight. Cihuatlan, Mexico: Super Fly: Pedro Guevara (34-3-1) W KO 5 Marvin Solano (21-4). Bantam: Karim Arce (15-0-2) DREW 8 Francisco Alarcon (7-2-2). Guevara stays on course for a world title shot with kayo of Nicaraguan Solano. The visitor had advantages in height and reach over Guevara but not the punch to keep Guevara out, The Mexican was getting inside from the opening round and Solano spent much of each round pinned to the ropes as Guevara worked the body. A right in the fourth rocked Guevara back on his heels but he was soon grinding Solano down again. In the fifth a powerful straight right floored Solano and he was unable to beat the count. Since losing his WBC light flyweight title to Yu Kimura in 2015 Guevara has won 8 out of 9 fights with the loss coming on a majority decision against Ken Shiro in an unsuccessful challenge for his old WBC title in 2017. He is down at No 7 super flyweight with the WBC so some way to go before he lands that title chance. First loss by KO/TKO for Solano. Arce is a big name for any Mexican fighter to carry around and young Karim is making heavy work of it. On paper this should have been a routine win for Arce and he came out swinging trying to blow Alarcon away. Alarcon refused to fold and war commenced. They put on a rousing battle with Arce’s face a mask of blood as they swapped fierce uppercuts inside and battled to the final bell and a standing ovation. A draw was the right result. Still only 20 there is time for Arce to improve after all Hall of Famer Uncle Jorge was a modest 4-1-1 at the start of his career and went on to win five world titles in four different divisions. Alarcon was 5-1-1 in his last 7 fights but strictly a prelim level fighter. Atlantic City, NJ, USA: Heavy: Jermaine Franklin (18-0) W PTS 10 Rydell Booker (25-2). Heavy: Otto Wallin (20-0,1ND) ND 1 Nick Kisner (21-4-1,1ND). Franklin keeps his 100% record with unanimous verdict over Booker. The youth, speed and work rate of Franklin were just too much for 38-year-old Booker. Booker was competitive overt the first half of the fight but never really looked like doing more than setting Franklin some puzzles to solve. Booker’s experience helped him get through the later rounds as Franklin was in total control. The Saginaw youngster showed excellent skills and plenty of movement and continues to improve. Scores 98-92 twice and 99-91 for Franklin. A former National Golden Gloves champion Franklin, 25, is worth following. Booker’s is a sad story. Now 38 Booker was an outstanding amateur who failed to make the US Team for the 2000 Olympics. In 2001he was selected to represent the US at the World Championships to be held in Belfast but left the training venue under a cloud. and turned pro. He won his first 22 fights but in 2004 was arrested for possession with intent to deliver heroin. Whilst out on bail he lost to James Toney for the International Boxing Association world title. Later he was sentenced to 12 to 30 years over the heroin arrest and served more than ten years. After his release he returned to the ring last year winning his two fights. As an amateur he fought at 201lbs but he was 238 ½ lbs for this fight. Wallin’s US debut comes to an unsatisfactory end as both he and Kisner suffered cuts in a first round clash of heads, Before the start of the second the doctor advised that Kisner’s cut was too serious for the fight to continue so it ended as a No Decision. A pity as the 28-year-old 6’5 ½” Swedish southpaw had been inactive since beating fellow-Swede Adrian Granat a year ago. Kisner had won 5 of his last 6 fights. Vienna, Austria: Middle: Marcos Nader (21-1-1) W TKO 8 Gogi Knezevic (34-9-1). Austrian Nader continues his comeback with a stoppage of Knezevic. Not a difficult night for Spanish-born Nader. Knezevic started brightly but once Nader found the range it was a one-sided contest. Nader broke Knezevic down with hooks and upper cuts. In the eighth he backed Knezevic to the ropes and floored him with a powerful right and Knezevic did well to make it to his feet. When the action restarted Nader hurt Knezevic with a couple of body punches and Knezevic turned away in pain and the referee waived the fight over. Nader, 29, collects the vacant IBF International title. A former European Union champion Nader was Austrian champion in the amateurs at 17 when he needed a special permit to compete because of his age. In the pros after losing the EU title in January 2014 Nader signed up for the AIBA Pro Boxing hoping to qualify for the 2016 Olympics but he failed and was inactive from November 2014 until returning with a win in April 2018. Knezevic, 39, now has nine losses by KO/TKO. Henin-Beaumont, France: Light: laid Douadi (17-0-1) W PTS 10 Renald Garrido (24-22-3). Home town fighter Douadi wins the vacant French title on a split decision based on some widely varying scores leaving Garrido with good cause for complaint. Douadi boxed neatly over the first two rounds using some accurate jabs to pierce Garrido’s defence. Garrido is one tough, aggressive fighter and pretty soon Douadi was being forced onto the back foot as Garrido marched forward connecting with hooks and uppercuts inside. It developed into a clash between the crisp, accurate punching of Douadi and the busier inside work of Garrido who looked to have built a substantial lead. Douadi banged back to stage a strong finish but it was questionable whether he had done enough. It was a close fight with one judge giving it to Garrido 97-93 and a second to Douadi 96-94 and the third an unbelievable 100-90 for Douadi! The local fighter gets the title but when you see a score like that the words home town loom large. Douadi is rated No 17 in the EU ratings and was having his first ten round fight. Former French champion Garrido is a warrior who will fight anyone anywhere and he occasionally springs a surprise against the local boxer-but not this time. Hopefully he will get a return. Luebeck, Germany: Heavy: Mohamed Soltby (16-1) W DISQ 4 Toni Thes (15-8).Light Heavy: James Kraft (15-0-1) W PTS 8 Philipp Kolodziej (10-8). Super Middle: Toni Kraft (15-0-1) W PTS 8 Tomas Bezvoda (6-5). Super Welter: Antonio Hoffmann (21-1) W PTS 8 Gabor Gorbics (26-16). Soltby wins the vacant IBF Baltic title as Thes gets thrown out for one foul too many. Russian-born Soltby was able to spear the much smaller Thes with jabs and land long rights. He put Thes down in the first but could not keep him there. Thes made bull-like head down rushes his tactic of choice and he was dangerous with his head and lost a point in the first. Thes wrestled Soltby to the floor in the second and lost another point and also tried to knee Soltby in a clinch. He was a disqualification just waiting to happen. Through all this Soltby stuck to his boxing landing some stiff jabs and thudding rights but he was a sane fighter in an insane fight. Thes lost a point for a low punch in the third. Soltby landed some heavy punches in the fourth and Thes twice tried to use his knee in a clinch and on the second occasion the referee disqualified Thes. The 6’4 ½” Soltby is trained by former WBO lightweight champion Artur Grigorian who won the title in 1996 and lost it to Acelino Freitas in his eighteenth defence. He finished with a 38-1 record. Soltby showed some useful touches but was stopped in five rounds by Nathan Gorman in November 2017. The remarkable thing about German Thes is that he has found 15 fighters to beat but then nine of his opponents had never won a fight and the other six were only a smidgen better. In an all-German contest Kraft takes unanimous decision over southpaw Kolodziej. Kraft had lots of height and reach over the crude Kolodziej and easily dominated the action when he boxed at distance. Unfortunately he had problems with the wild lunging attacks of Kolodziej and too often when Kolodziej got inside Kraft promptly grabbed and held Kolodziej to stop him fighting. Kraft did what clean work there was but it was an untidy fight. Scores 78-74 twice and 79-73 for Kraft. The 6’3” 22-year-old from Munich has been very carefully matched and could be found out when he gets his first real test. Kolodziej has lost 3 of his last four fights. Brother Toni Kraft boxed his way to victory in this one. Czech Bezvoda came to fight. He was walking into Kraft for the whole eight rounds. Kraft kept pumping out jabs and using quick movement to fight on the outside. Bezvoda pressed and pressed but Kraft was very nifty and quick with his punches. When Kraft chose to stand and trade he was able to connect with sweeping hooks and Bezvoda was too slow with his counters but his pressure was enough to get him a share of a round, Scores 80-72, 79-73 and 78-74 for Kraft. Again the opposition has been non-threatening so not sure at this stage how far Kraft can go but I have my reservations. Fourth loss in a row for Bezvoda but he forced the fight all the way. Hoffmann looked the most accomplished boxer on the show. The Angolan-born fighter just walked experienced Gorbics down from the first to the last bell. He was marching in behind the high guard so favoured in German rings. When he closed the distance he was firing quick bursts of hooks and uppercuts to head and body and Gorbics hardly ever ventured far from the ropes. Despite that the Hungarian was always looking to fire back. He threw plenty of jabs and connected with occasional straight rights but for most of the fight it was Hoffmann pounding away but finding Gorbics a durable opponent. Scores 78-74 twice and 79-73 for Hoffmann. The only defeat suffered by Hoffman was a points loss to Canadian Steven Butler in 2016 and he has won eight on the spin since then and collected the Global Boxing Union World title. Gorbics is 2-7 in his last 9 fights which is made up of 2 home wins and 7 losses on his travels. Culiacan, Mexico: Fly: Ricardo Sandoval (15-1) W TKO 6 Christian Aranda (?). Feather: Joseph Landeros (16-0) W RTD 5 Ricardo Rojas (10-3). “Nino” Sandoval wins the vacant WBC Youth Inter-Continental title with stoppage of substitute Aranda. Sandoval dominated the fight before flooring Aranda in the sixth. Aranda made it to his feet but his corner threw in the towel. Tenth win by KO/TKO for 20-year-old Californian Sandoval. He was to have faced unbeaten Giovanni Gonzalez but local sources indicate Aranda came in instead so some confusion over the opponent. It is now 16 fights and 16 wins by KO/TKO for young Landeros. He handed out a beating to Rojas with the bell saving Rojas in the fourth Landeros piled on the punishment in the fifth and Rojas retired at the end of the round. The 20-year -old from Riverside, Californian is trained by former WBC bantam and WBA super bantam champion Raul “Jibaro” Perez. Landeros is yet to be taken past the fifth round for a win. He lifts the WBC Youth Silver title. First loss by KO/TKO for Rojas. Ciudad Sandino, Nicaragua: Bantam: Alex Espinoza (18-1-2) W PTS 8 Martin Diaz (15-9-11ND). Diaz came in way over the limit for this fight but it did him no good as Espinoza was better in every department. He had the quicker and more accurate shots on the outside and had more power in his uppercuts and hooks inside. Diaz tried to get close to work but he always came out worse in the exchanges. Espinoza is not a big puncher and he never really had Diaz in any trouble but he was a comfortable winner taking the unanimous decision. Espinoza’s only defeat is a split decision in Russia to former World Amateur Champion Mikhail Aloyan. This is his third win since then and he is No 8 with the WBA. Diaz was 5-0,1ND going in. Bacoor, Philippines: Fly: Alphoe Dagayloan (13-2-5,1ND) W PTS 10 Esneth Domingo (11-1). Minimumweight: ArAr Andales (10-0) W PTS 10 Cris Ganoze (17-3). Southpaw Dagayloan holds on to his WBA Asian title with unanimous verdict over Domingo in a spirited battle. 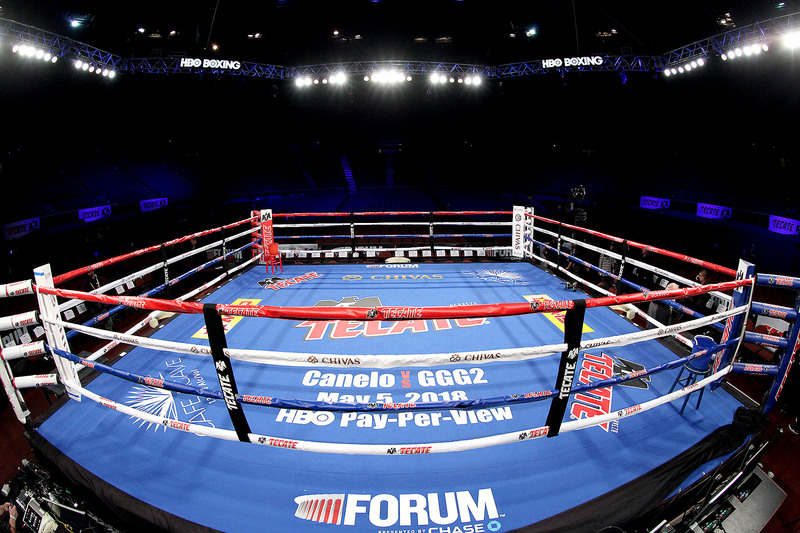 No prisoner taken here as the less experienced Domingo matched Dagayloan throughout the ten rounds. In the end it was the strength of the champion that saw him come out a winner. Scores 98-92, 97-94 and 96-94 with the last a better reflection of what happened inside the ropes. The 27-year-old Dagayloan stretches his unbeaten run to ten fights. Domingo, 20, lost but raised his stock. In another WBA Asian title fight champion Andales remained unbeaten as he outpointed southpaw Ganoze. Just 19 Andales shows plenty of potential. Ganoze was 5-1 in his last six fights. Fight of the week (Entertainment): Derevyanchenko vs. Culcay was a high quality entertaining contest. They don’t have to be big to be great and Karim Arce vs. Francisco Alarcon had the fans on their feet for all eight rounds. Punch of the week: So many to choose from this week but I go for the right from Lomachenko that put Anthony Crolla face down on the canvas. I must give honourable mentions to Arnold Barboza’s right uppercut that was the beginning of the end for Mike Alvarado, Guido Vianello’s right that sent Lawrence Gabriel down, the pile-driving straight right from Pedro Guevara that destroyed Marvin Solano and Peter Kadiru’ s right that flattened Vincenzo Febbo. A painful weekend for some.